Photo Caption A: Female leaders of business share stories of achieving professional and personal success during the “In HER Shoes” panel at the second annual Berkeley LeadHERship Brunch, held on March 10, 2017, at Berkeley College in Brooklyn, NY. A group of dynamic female leaders from Berkeley College gathered with like-minded successful businesswomen during the second annual Berkeley LeadHERship Brunch on March 10, 2017, at Berkeley College in Brooklyn, NY. 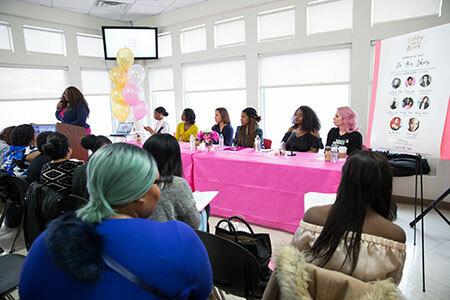 Created by LaTia Sinclair, Director for Multicultural and Community Affairs, Berkeley College, the event was held as part of Berkeley College’s celebration of Women’s History Month, with the purpose of empowering women to achieve professional and personal success in their lives. The Berkeley LeadHERship Brunch featured interactive workshops, musical performances, and panel discussions with businesswomen sharing advice on topics like leadership, entrepreneurship and brand identity. 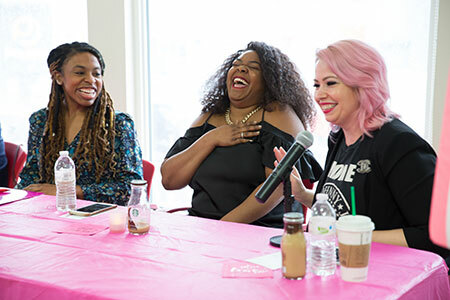 During the “In HER Shoes” panel, author, podcast host and life coach, Cara Alwill Leyba, emphasized the importance of collaborating to ensure the advancement of women collectively. “In a world of ‘Look at Me’ girls, be a ‘Come with Me’ girl,” she said. Photo Caption B (L to R): Jennifer Daniel, Founder, Princess Chambers Inc.; Christina Brown, Founder, Brown Girls Love; and Cara Alwill Leyba, Author, podcast host and life coach, share advice with future female leaders of business during panel discussions at the second annual Berkeley LeadHERship Brunch, held on March 10, 2017, at Berkeley College in Brooklyn, NY. Ms. Steele was among those who were honored for their leadership in academia or their professional careers during the event’s “Phenomenal Woman Awards” luncheon. Other honorees included Berkeley College students Fleurika Ambroise, T’ Lyssa Connell, and Tamra Newton, as well as Iessa Sutton, Campus Operating Officer, Berkeley College in Brooklyn. 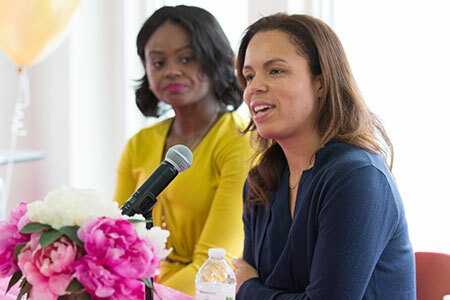 Photo Caption C (L to R): Naomi Yane, Reporter, NY1 News, and Miriam Milford, owner of BCakeNY, share advice with future female leaders of business during panel discussions at the second annual Berkeley LeadHERship Brunch, held on March 10, 2017, at Berkeley College in Brooklyn, NY. Click here to view more photos from the second annual Berkeley LeadHERship Brunch, and click here to read about additional events being held at Berkeley College in honor of Women’s History Month.